Snowtime! 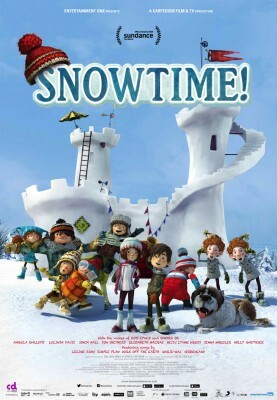 follows the story of the initially-reserved Luke, an 11-year-old boy who uses his bugle and natural leadership skills to lead his classmates in the ultimate snowball fight. The film is well-scored and beautifully-animated, with lively and colourful visuals and a premise that practically runs on its own. It would have been a delightfully silly winter romp if it were not assaulted with drama that would be considered dark even in a movie for adults. The film pitches more jokes in a minute than its characters do snowballs, but on the whole it still manages to make both child and parent feel more uncomfortable than entertained. The humour is composed mainly of stilted and unapologetic pablum, and the awkward (for the audience) romance between Luke and Sophie ranks near the top of the movie’s cringeworthy efforts. It’s hard to hear an 11-year old boy deliver any pickup line that ends with him wiggling his eyebrows and asking a girl if she wants to “give him a ride” without being at least a little creeped out. Additionally, Luke’s crush is marketed toward an entirely separate group of kids than the very young audience most of the movie’s jokes work for. Snowtime! can’t decide if it’s for four- and five-year-olds who want to hear fart jokes, or 10- and 12-year-olds dealing with a first crush, and fails miserably in trying to please both. Either way, most of the film’s genuine entertainment occurs when it forgets its stilted setups and simply allows its characters to act naturally, bouncing off of each other’s personalities and behaving like kids instead of miniature, stereotyped adults. The constant barrage of comedic attempts do at least add up to some comedic momentum, only to derail it with a blast of heavy tragedy from left field. In a film for a younger audience where simply being socially awkward is sufficient to make a character sympathetic, Snowtime! piles on heartrending backstory with no real preface or follow-up, making the tragic revelations feel more like an unexplained sucker punch than a dramatic moment, and switching from rambunctious fun to heavy pathos so quickly it risks giving its audience whiplash. The finale of the movie drives home its simple moral, “war and hurting each other is bad,” with a disturbingly mature calamity which shifts the film’s tone so quickly its gears grind. Snowtime! is a visually beautiful film, and the jokes that do work work well, but it can’t be entertaining until it learns how to balance.